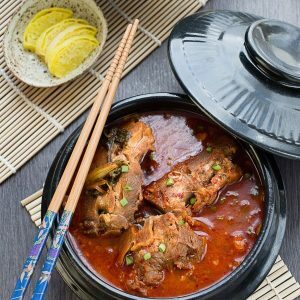 An authentic Korean Pork Bone soup (Gamjatang) is delicious, spicy, rich and full of flavor to warm you up on a cold winter day! My husband's favorite soup! Soak the pork bones in a large bowl in cold water for 2 hours to remove any blood. Drain water and wash bones. Put the bones into a large stock pot and fill with enough water to cover the bones. Add 4-5 slices of sliced ginger (to remove the pork smell). Boil water and remove any scum that surfaces to top of water. Drain water, discard ginger slices and rinse the pork bones. Add 10 cups of new water to pork bones and boil again. Add sliced onion, dried shitake mushrooms, minced ginger, soy bean paste and dried red chili pepper to pot. Boil the pot for 1-1/2 hours over medium heat. About 1-1/2 hours later, take the red hot chili pepper and shiitake mushrooms out of the pot. Slice shiitake mushrooms into bite sized pieces. In a small bowl, combine the minced garlic, fish sauce, cooking wine, Korean red pepper paste and Korean coarse red pepper powder in a bowl. Add the sauce, potatoes, Napa cabbage, green onions, asian chives, soy bean sprouts, Perilla leaves and the chopped shiitake mushrooms into the soup. Simmer on medium heat for another 30 minutes. minutes later, transfer the soup into a serving bowl or Korean earthenware, top with sesame seeds and/or black pepper. Serve with rice and/or Korean banchan (Korean side dishes). This soup takes time and patience and requires some ingredients from a Korean or Asian supermarket but the flavorful broth combined with the fall of the bone pork will be well worth the effort. The total time from start to finish to complete will take around 4-5 hours.